Lilacs, oh sweet lilacs, how I love the sight and smell of you every spring. But oh, how I hate how quickly your petals turn brown and drop. The day prior to this photo session I made a mental note to myself that if I was going to photograph the lilacs from my garden it would have to be tomorrow afternoon. I couldn't predict the exact time or the quality of the light at sunset but I was going to start getting prepared. I set up a background using a deep rich red throw for my couch and spent ten minutes removing the worst of the cat hair that still remained after washing and drying it. Animal lovers understand, I'm sure. Did a quick pre-visualization of the various flowers I was going to pull fresh from the garden tomorrow: lilac, bleeding hearts, bridal wreath and wildflowers. Next I set down a purple vase and also my deep purple infinity scarf that worked so well one other time. Lastly, I set down my two brand new books that I had recently purchased. I was as prepared as I could be since it was difficult for me to know what the light was actually going to be like 24 hours from now. Now, all I could do was wait and see. And so 20 plus hours later, the Sunday still life photo session began. I filled the purple glass vase with water and went outside with scissors in hand to clip the flowers that would be placed in the vase. My neighbor on the north side gave me permission to snip one branch from his lilac bush to fill in a gap that needed to be filled. Thank you, Patrick. Once the arrangement was designed to my satisfaction I knew I'd have 1 - 2 hours to play with various set elements before I lost the magic light at sunset. This day was changes a go-go. 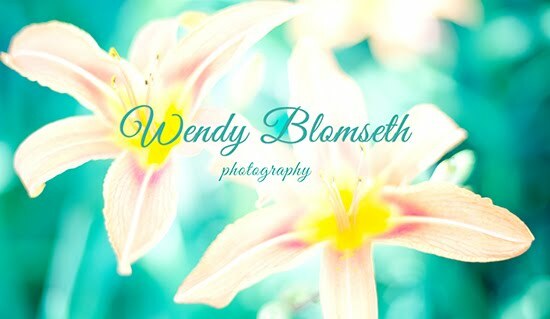 I hated the red throw as my background because it looked too orange in today's light. After five photos I looked around and saw a similar fabric in a light soft tan color. I decided to try that one and took about 15 pictures but wasn't in love with that either. The sun was just too high and too bright. It simply blasted out every bit of color and texture in the fabric. I took down that second throw and looked at the base fabric which is actually simply a light blocker. But that didn't work either because it was again, too red. Then I started to get nervous. I looked at the flower arrangement for some inspiration and instruction. Something told me to look through my inventory of shawls to find one with complimentary colors. Eureka, I found a beautiful shawl that worked perfect and clipped it at mid-height to the light blocking background. A couple test photos revealed it was a good fit but it had a fold that was unacceptable and just had to be straightened. I raced downstairs to get my hand held iron and an extension cord and got to work. It only took 3 - 4 minutes for the iron to heat up and I ironed the shawl while it was hanging up. Then, what next? Something else was needed, but what? I did the typical liquor in a fancy glass but that was boring and cliche. Not today. I thought it would be fun to add my favorite set of Royal Albert polka dot coffee mugs which always make me happy. How can polka dots not make one smile? Outside for one last flower clipping, my neighbor Lori surprised me by shouting over to me "Do you want a couple of cookies, I made too many?" I thought for a moment and then asked "What kind of cookies?" thinking I should say no (too many calories). She said "chocolate chip cookies." So of course, I weakened and said "Yes, I'll give them to my husband. ": Sweet Lori walked over with a small plastic bag containing two cookies that I immediately brought inside and put on my husband's dinner plate telling him the cookies were for him. But within minutes, I realized that was a terrible mistake. 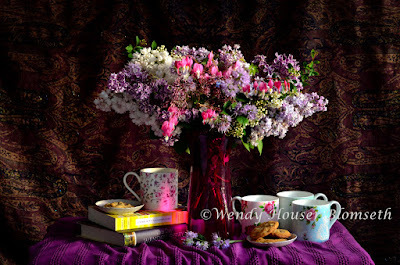 That would have been the finishing touch to the portrait - flowers, vase, books, coffee and COOKIES! What was I going to do? I couldn't take back the cookies from my husband. Well, I did the only logical thing. I walked over to Lori's house and rang the door bell. She greeted me by saying "Oh good, you want more cookies, right?" Sheepishly I said, "yes, actually, could I have three or four cookies that I'll photograph and return to you after I'm done?" Honestly, she was delighted that I was removing these oh-so-tempting cookies from her house. Because time was now of the essence, I ran back in the house, dashed down the basement to get my tiny little dessert plates which would be perfect to hold the cookies and placed the final sweet addition to today's "Sweet Lilacs" still life portrait. I find it delightfully amazing and wonderful how each of my still life sessions evolve into their own little adventure story of how they are created "with a little help from my <sweet> friends." Each one is a gift that I give myself and, of course, I gift my friend with a reproduction as well.